The weather this morning was in keeping with the rest of the spring, as in overcast and windy. I did have plans to head up to Glapthorn Cow Pastures to see if the Black Hairstreaks had emerged but the cold wind outside made me think there was little point in wasting the fuel. Instead I headed just up the road to Salcey Forest to see what I could find. By midday the temperature had raised slightly so i parked up in the horse box car park and started to explore the south side of the forest. Almost straight away Wood Whites surprisingly could be seen battling against the wind, I find it hard to believe how strong they are at flying considering they look so flimsy and delicate. In the first clearing a Common Blue and Speckled Wood could also be seen, as was a Hornet which wasn't hanging around for pics but nice to see all the same. I continued my walk down and into the less frequented rides on the outskirts of the forest. 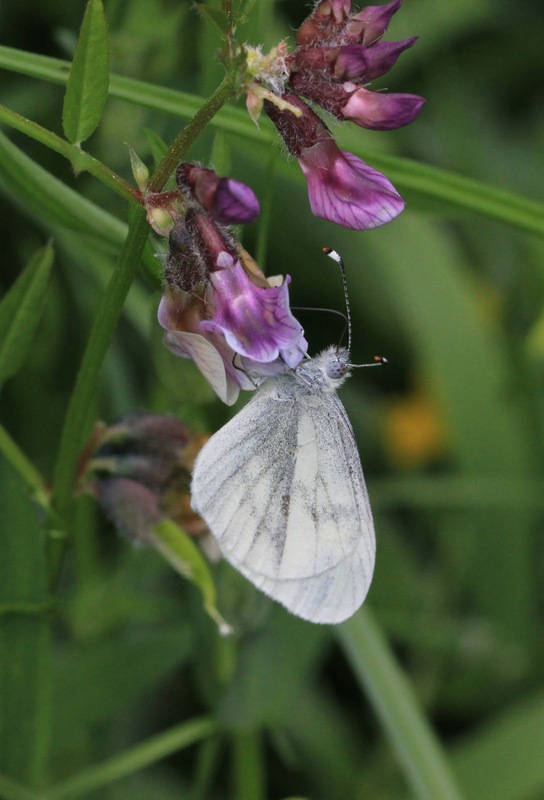 More Wood Whites were dotted around aswell as the odd Speckled Wood. A nice Drinker Moth caterpiller was busy feeding at the end of a stem. The insect of the day though had to go to the beetle I encountered just around the corner. 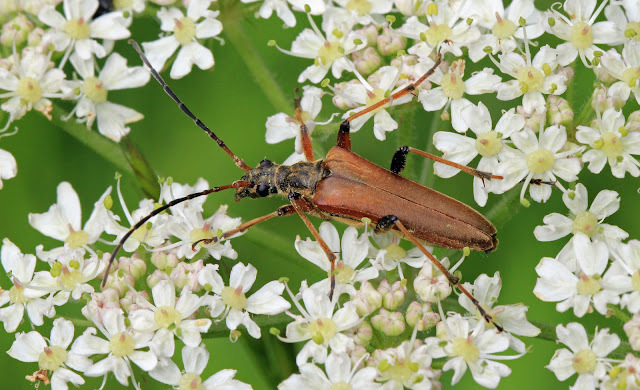 As I strolled along the path I saw a large beetle flying along the grassland to my right. 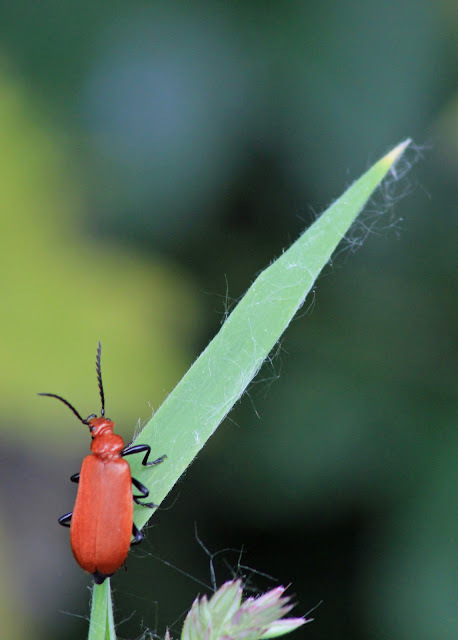 It landed on a leaf and I could see it was a large Cardinal Beetle sp, closer inspection showed it to be a Black Headed. This was certainly a first for me and although I am unsure of the exact status of these a brief internet search show that they appear to be rare so it was a good find. As I strolled along this section I came across a couple of Crab Spiders (see bottom of post for more details), and couple of Wolf Spiders with egg sack and a stretched out Nursery Web Spider enjoying the sun shining in between the constant clouds. 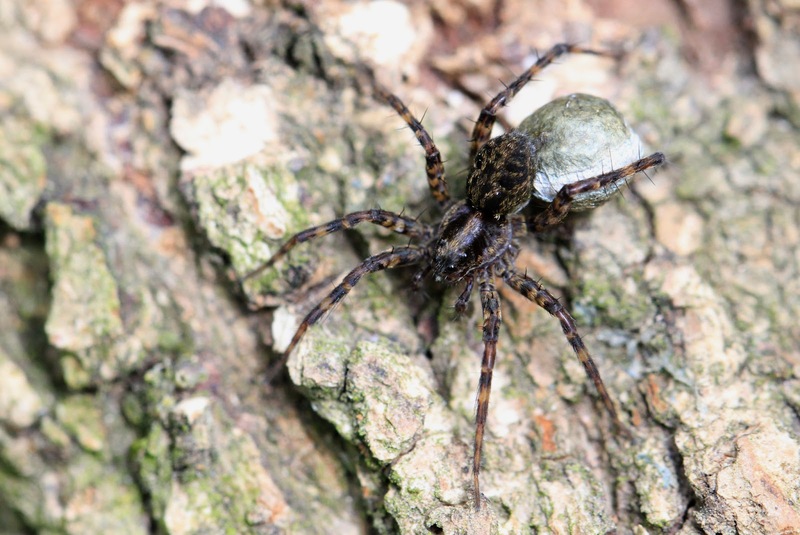 Wolf Spider with egg sack. 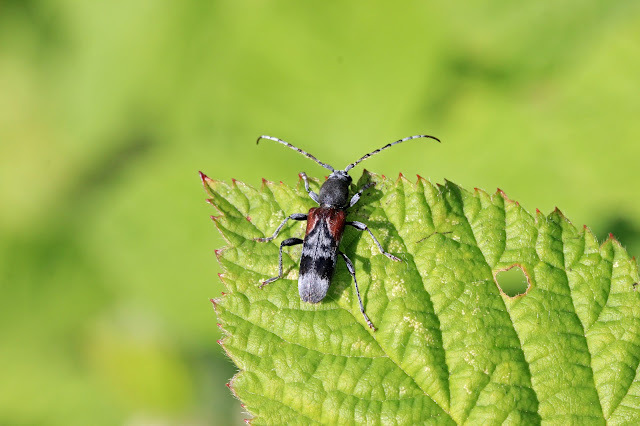 It is interesting what you can find along these quiet stretches of the forest and in amongst the Bees, Flies and Spiders the other notable insects that were out in force were the Longhorn Beetles. 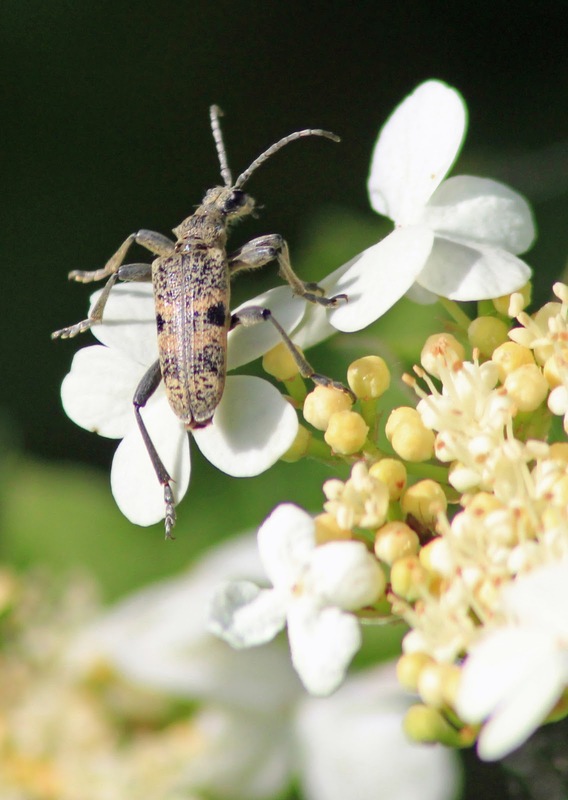 They seemed to be on every flower and a few different Longhorn Species could be seen, including a pari of Rhagium Mordax mating. 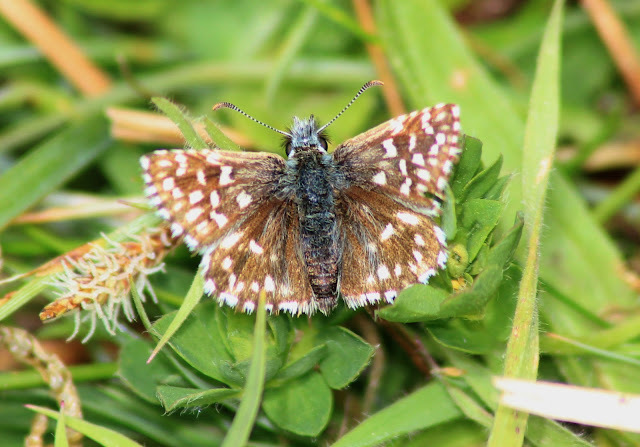 In total I saw 12 Wood Whites, 2 Common Blues, 4 Speckled Woods and 2 Small Coppers further down in the meadow area. As an added bonus I also stumbled upon an area with at least 2 (possibly 4) Common Lizards, I had never seen these before in the Forest so they were a nice surprise. Common Lizard, Salcey Forest, Northants. I also saw a Grass Snake in one of the clearings but unfortunately I wasn't fast enough with the camera to get a pic, it always amazes me just how fast these reptiles can move when they're spooked! 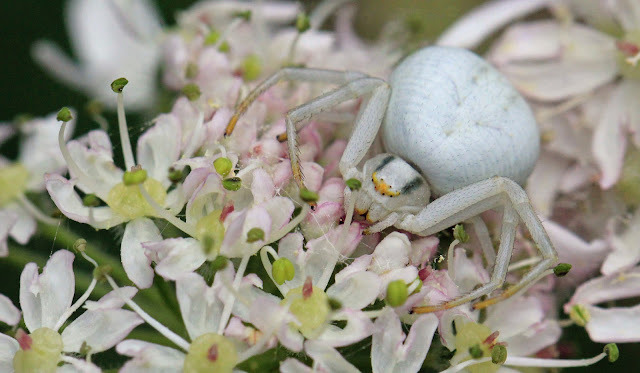 That was pretty much the end of the walk but I shall include below a short section about one of my favourite arachnids, the Crab Spiders, which were fairly frequent along my stroll through the forest. 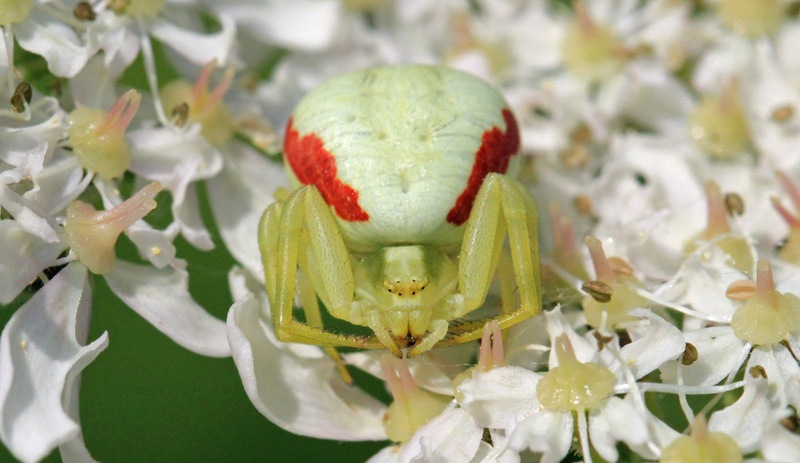 As previously mentioned I do have a soft spot for these stunning spiders and so it is always a pleasure when I spot one on a flower head. They can be remarkably hard to see, in fact you'll surprised how often the first time you notice one is when you look at a photo of a flower you have taken on the computer to see a small spider looking back at you. They can change colour to match the flower they are on and then they wait for an unsuspecting insect to pass buy and nectar on the flower. When they do they position themselves with outstretched legs (hence the "Crab" part of the name) and then they grab their prey and inject their venom. To me they are one of the epitome's of lethal beauty. I managed to take a series of photographs today showing them hunting which I will share on this blog. I could watch these for hours and my first one was at Glapthorn Cow Pastures a few years ago. 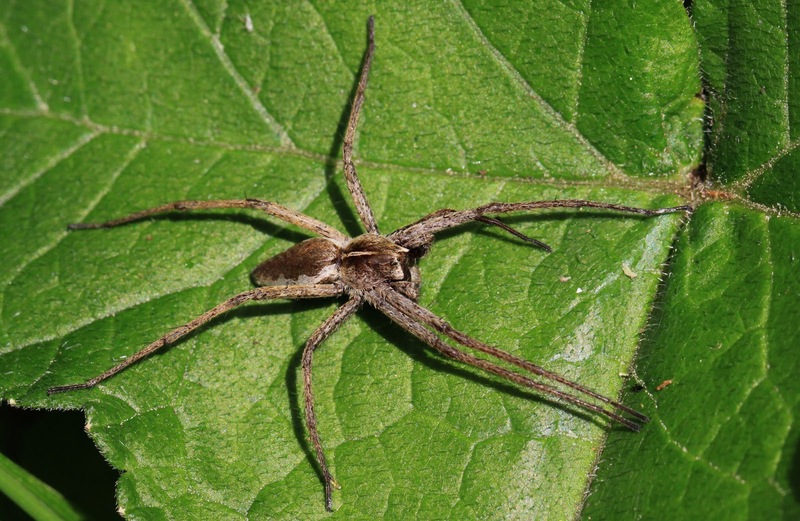 After reading up on these spiders I couldn't help but be enthralled and ever since then at this time of year I can't help but look for them when I am in the suitable habitats. Sometimes the Crab Spiders have a red ridge along the sides and sometimes they don't. I am fairly sure this isn't a sexing diagnostic as all I am aware of is the male is smaller than the male like a lot of spiders but i managed to get pics of both of the most common variants seen around here (ie with a red mark and without). 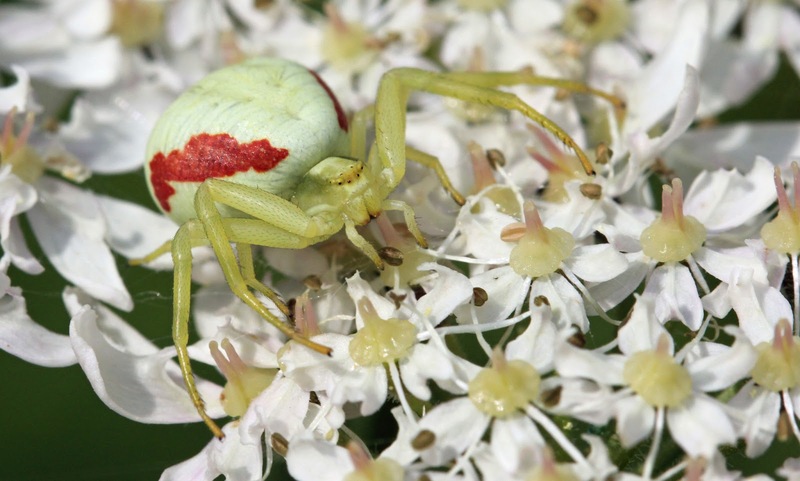 The Crab Spiders method of feeding is simple, they are ambush predators and wait patiently on the top of flowers waiting for their prey to come to them. When an insect approaches they open their legs slightly and wait for the prey to come closer. And when it starts to some really close it opens it's legs as wide as it can ready to grab the prey. As the unsuspecting prey comes close enough to grab the spider strikes and grabs the prey with it's legs and quickly sinks it's fangs in. It all happens so fast the prey has no idea what is going on and before it knows it it's dead. Here is a quick series of pics of the red variant hunting successfully. Insect comes closer having no idea of what is infront of it. And then bang! It's now lunch. I could watch these all afternoon, if ever a predator was the king of it's surroundings this is it. 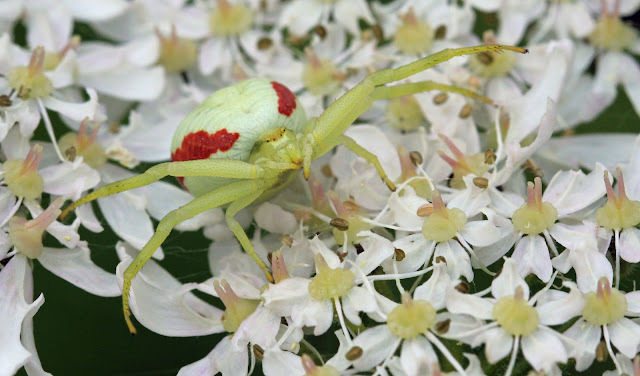 I wonder how many we walk passed without any idea of the stunningly well camouflaged killer siting patiently on the flower next to us? With birding continuing to be a little slow here in Northants I didn't take much convincing to take up my friends Jon and Kirsty's offer to head to Norfolk for the day. 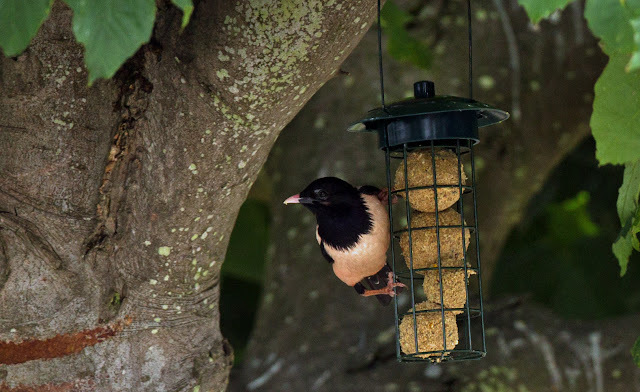 There had been an adult Rose Coloured Starling at Wells-next-the-sea for the previous few days so we decided to make this the target bird of the day with anything else being a bonus. We had a quick look around Chosely Barns on the way to Wells and was surprised to see a Turtle Dove wandering around in the middle of the road when we arrived. 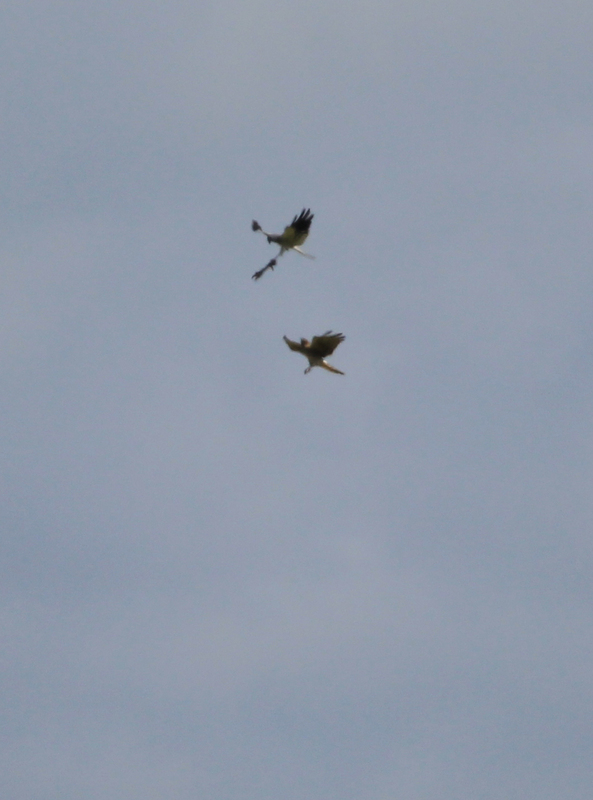 We originally went to see Corn Bunting but they were proving quite elusive at this time in the morning. They could be heard singing in one of the nearby fields and a tantalising glimpse of a chunky looking bird on the wires further down the road meant that we knew they were around. Eventually while we were admiring the Turtle Dove again a large passerine could be seen flying over to the tree behind us before flying onto the concrete pad - Corn Bunting day ticked at last! We then drove over to the target bird at Wells-next-the-sea. We parked up in town and then walked along the quay side to the road where the Rose Coloured Starling had been seen. The bird had set up home in a small tree above bird feeders in someones front garden. We arrived to hear it had been seen 15 minutes previous and we now positioned ourselves for the waiting game, and waited we did, in fact we waited for over an hour before someone next to us excitedly exclaimed that "it's out" and raising binoculars we saw a beautiful adult Rose Coloured Starling standing in the fork of the tree. It quicky fed and then hopped onto the nearby bush before disappearing out of view on the ground behind. We only had a short view but at least we knew it was here! It then flew back into the tree and we started patiently to wait again. Jon had already got some pics of the bird during it's brief sortie from the comfort of it's tree and very generously lent me his camera. An hour later it came out again and fed on the fat balls and this time seemed to be out for longer thane before. What a stunning looking bird! I did see one early in the year (at Exminster, see previous post from 2nd march) which was a juvenile but this adult was something else and had simply incredible plumage. Here's a pic I managed to get before it returned back up into the canopy. After this we went to have a look around Titchwell RSPB Reserve. By now the wind had really picked up and most of the birds were taking shelter on the islands. There wasn't too much to report though but lots of Little Gulls were there aswell as Black and Bar Tailed Godwits and perhaps the biggest surprise was a Wall Brown butterfly being tossed around in the strong wind by the dunes. I have to say the star of the reserve was this great looking Spotted Redshank was the star of the reserve as it fed along the shore of the small island infront of the hide. After a spot of lunch we then went to Holkham to hopefully get Jon and Kirsty some views of the Spoonbills. 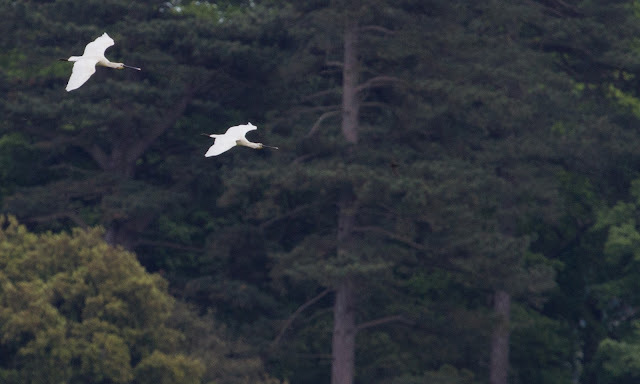 We had a walk down the the Jordan Hide and we didn't have to wait long before a Spoonbill flew into view and settled on the nearby lake. 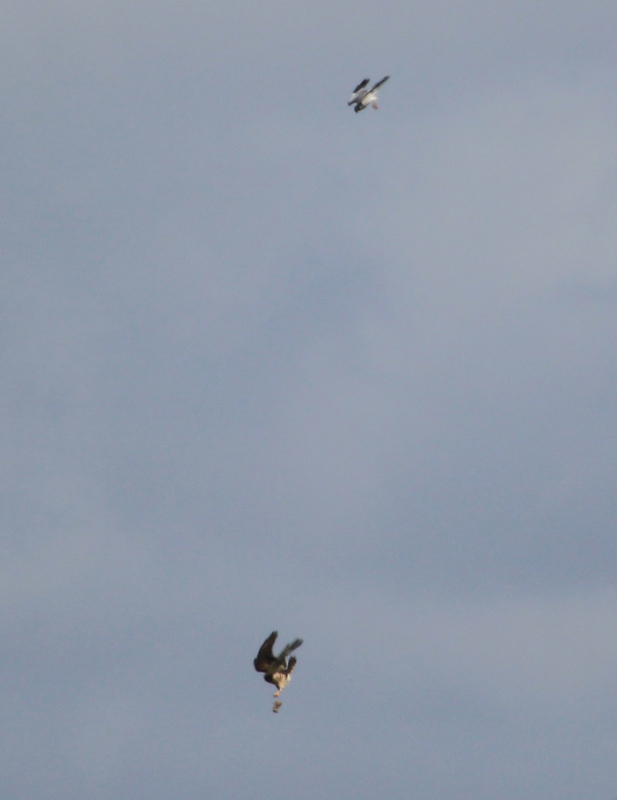 A pair of Marsh Harrier were flying around infront of us and we frustratingly just missed a food pass that happened out of our view. 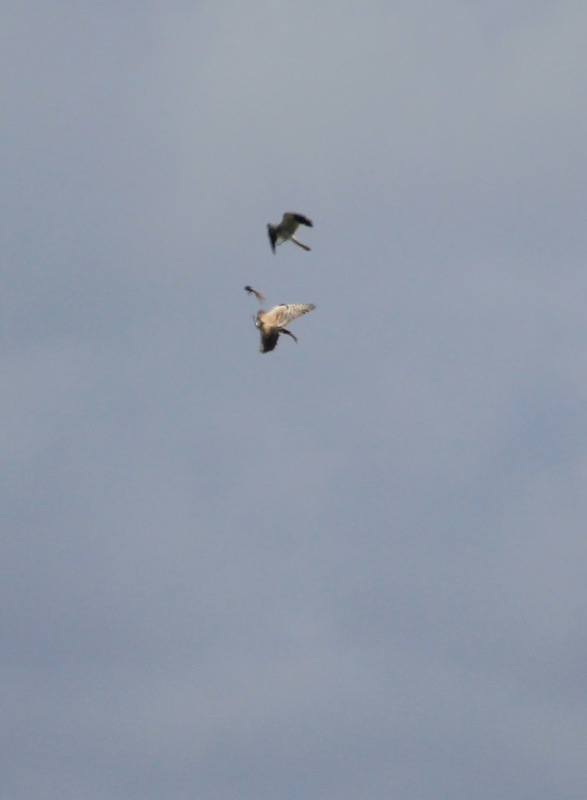 The Spoonbills (there were four by now) then took off and circled around before departing in opposite directions. Luckily though two came back and gave a good photo opportunity before gliding back onto the lake. 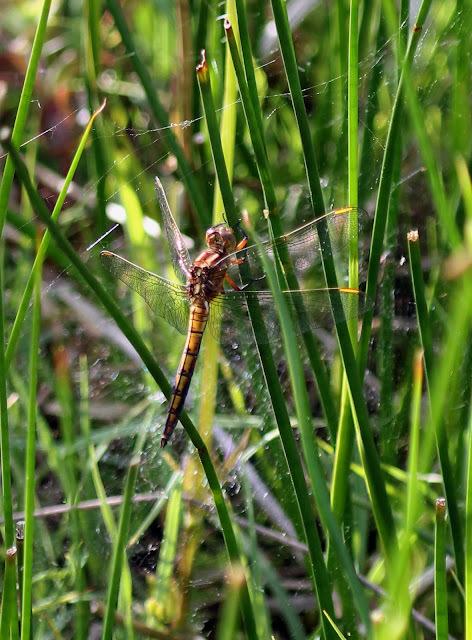 We then went to Holt Levels to look for Keeled Skimmer but as the wind was now very strong it proved to be more difficult than previously imagined but we did find four females (see pic below) in the more sheltered and boggy section along with a few Common Spotted Orchid. We then headed off to Kierans house to meet a couple more Norfolk (Robert and Connor) birders to have a good laugh before going back out for Nightjar. We went to a place I had never been before to see these great birds and I am very pleased we did. Jon picked up a bird churring from the far corner of the clearing we found ourselves in and the Kieran saw one in flight heading up from behind us. As it wasn't even dark yet you could pick up all the plumage detail in the binoculars and it wasn't long before it was joined by another one. One of the birds even perched in the branches of a dead tree in the centre of the clearing a couple of times before heading back down and continuing the chase after another Nightjar had joined in too. So we now found ourselves with three Nightjars flying around us as it got dark. One had perched really close to the group but as me and Robert had legged it back to the car to get the scopes we missed. Luckily though one came back very close (even flying along the path we were standing on!) and it couldn't have been more than 12 feet away when it finally turned and headed back towards the clearing. It was a great end to a great day and we drove home still buzzing from the days experiences. Irthlingborough Lakes and Meadows is the Wildlife Trusts latest reserve in Northants. It covers a large area and consists of lakes, meadows and lots of hedgrows including the hedge lined disused railway line that now forms the pathway heading from east to west creating a long natural "corridor". It is one of the best sites in Northants for wildlife watching and already this year it has come up with some great birds including Avocet, Green Winged Teal and the Firecrest so us birders are watching what the Trusts will be doing with interest. 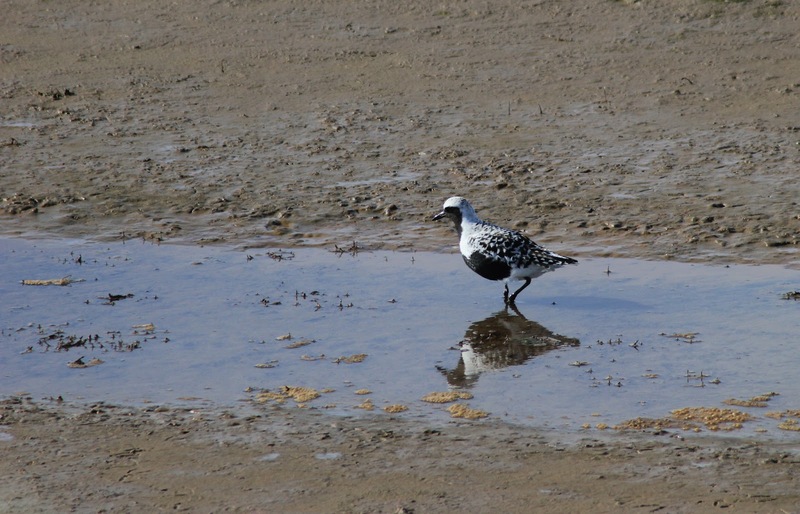 Perhaps wader scrapes and hides? 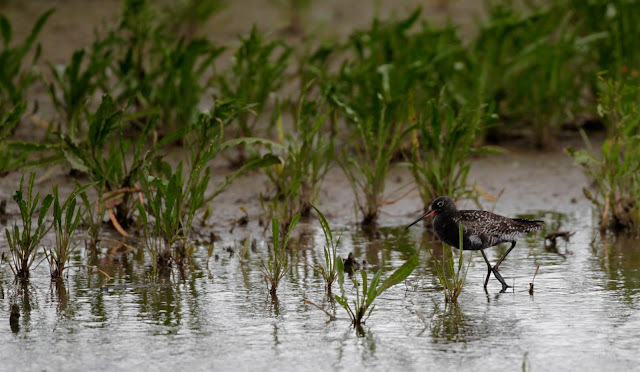 Managing the water levels in the field near Irthlingborough town itself will be good as a continual flooding could create some much needed breeding habitat for some of our birds. As it is now though visibility is at a premium as much of the undergowth is so high a walk along the railway line currently only gives you the occasional glimpse of the lakes, but work can be seen to be taking place with new paths going in and signs going up. At the risk of sounding old I can remember not too long ago the vegetation used to be so high you could barely see above it and you had to crash through it at some places to get anywhere so it is improving all the time. I had a good walk around but didn't see much out of the ordinary. As always with this site the amount of Warblers was very impressive and it seemed that every few yards there were new Garden and Willow Warblers, Chiffchaffs and Blackcaps. 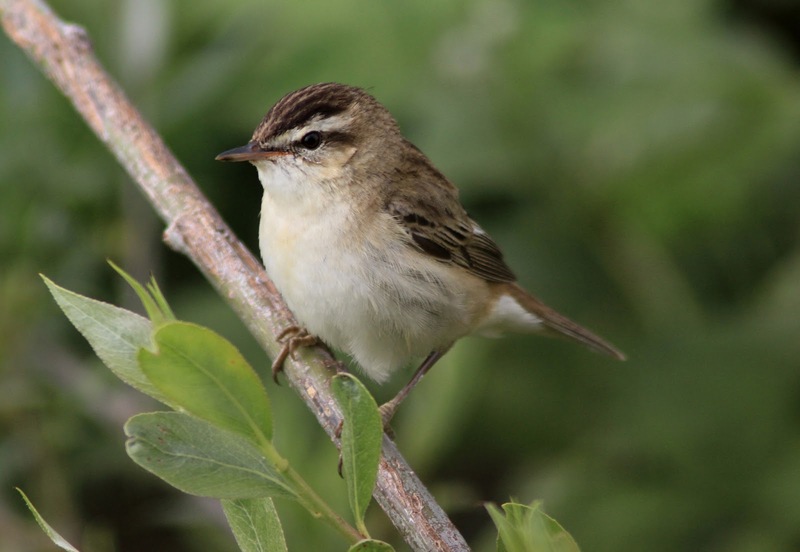 Reed and Sedge Warblers could always be heard cranking up into their rasping song along the reed fringed edges to the lakes. 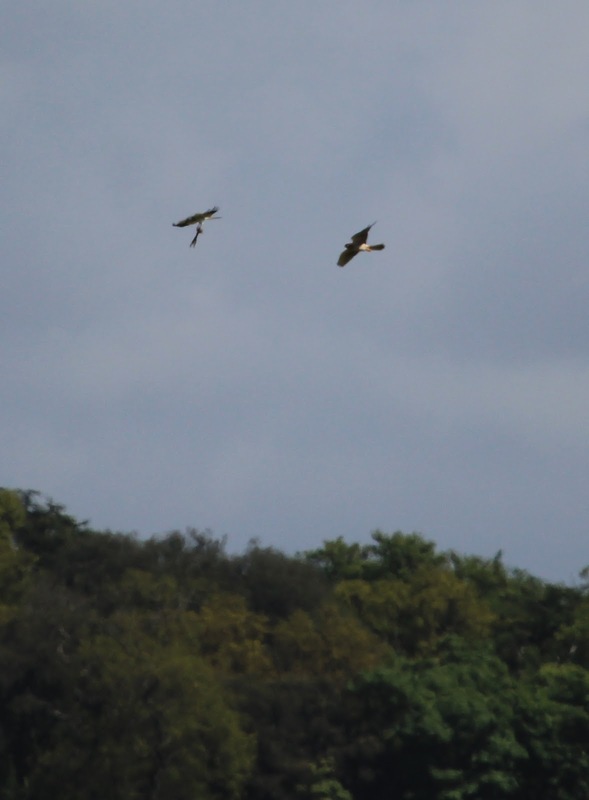 In the warm weather Buzzards were seemingly everywhere and were soaring in just about every direction you looked. Herons were calling from the Wilsons Pits area (another Wildlife Trusts reserve) but surprisingly I didn't see any Hobby, the whole area looks great for Hobby but the only falcons seen were a couple of Kestrels at either side of the reserve. It was a generally nice day to be out and after admiring a couple of Kingfishers on the river I set about looking around in the undergrowth as there had been a big emergence of Banded Demoiselle. I know that I quite often focus mainly on birds in this blog but I am interested in all forms of wildlife, especially insects. 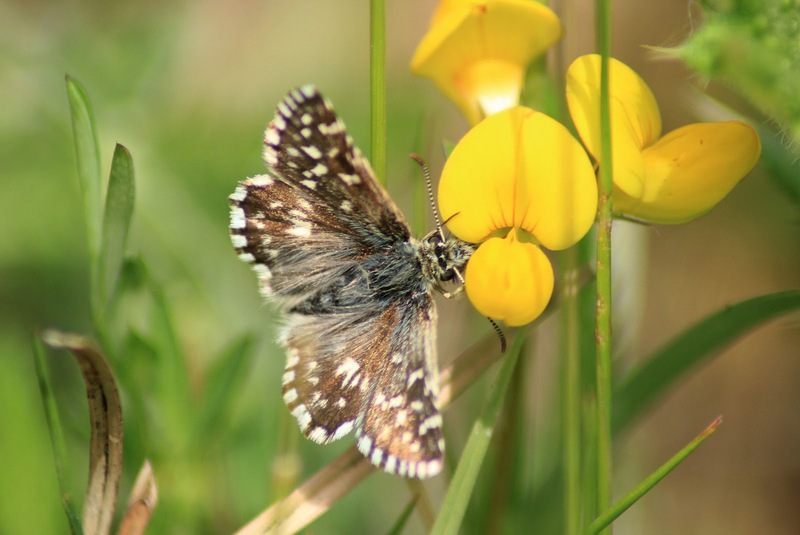 In the summer months I can sometimes forget all about birding and spend most of my time looking for butterflies and any other bugs I can find. I guess it's like reliving your childhood again, you know that feeling you got when at the beach as a child and you lift up a rock to find a crab? Well rockpools are in very short supply in Northants so I spend my time creeping around meadows and the reeds along the sides of rivers looking surprises in the undergrowth. It is something that I probably should have grown out of by now but I unashamably haven't, even if I do get some funny looks from walkers as they find me on my hands a knees taking pics in the grass. Anyway I am drifting from the point a little. I followed the river taking these following pics along the way, the Common Damselflies were taken just outside the reserve boundary but the rest were taken near the river section of the reserve itself. 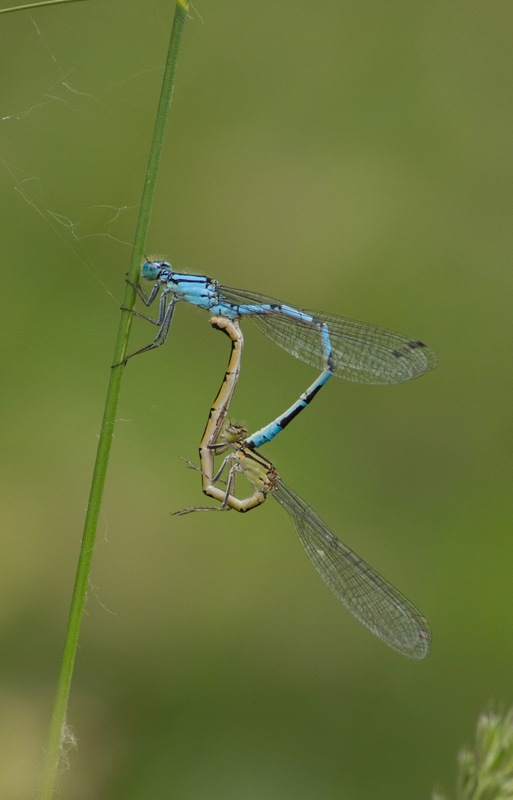 Common Blue Damseflies, River Nene, Northants. 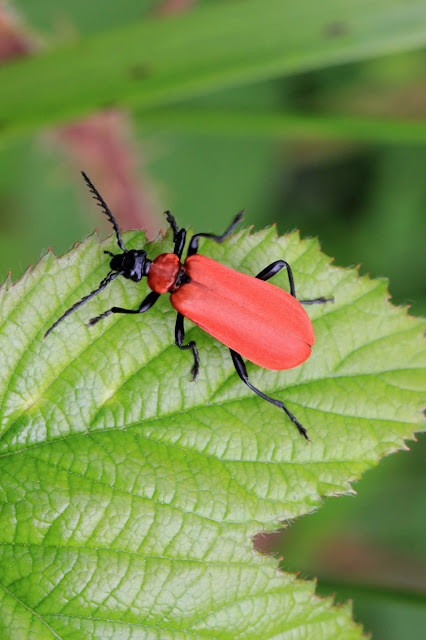 Cardinal Beetle, Irthlingborough Lakes and Meadows, Northants. 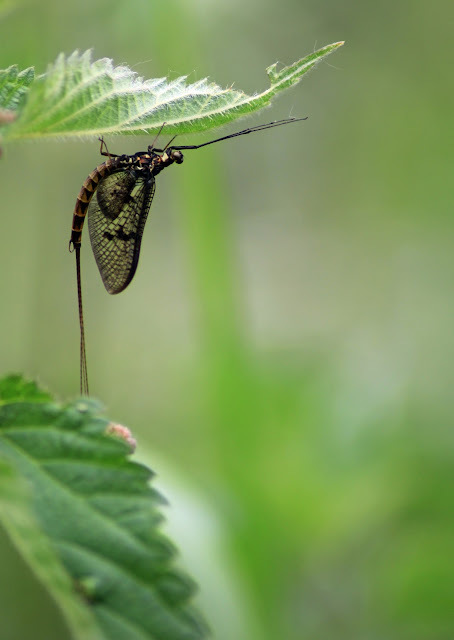 Mayfly, Irthlingborough Lakes and Meadows, Northants. Longhorn Beetle (Rhagium Mordax), Irthlingborough Lakes and Meadows, Northants. 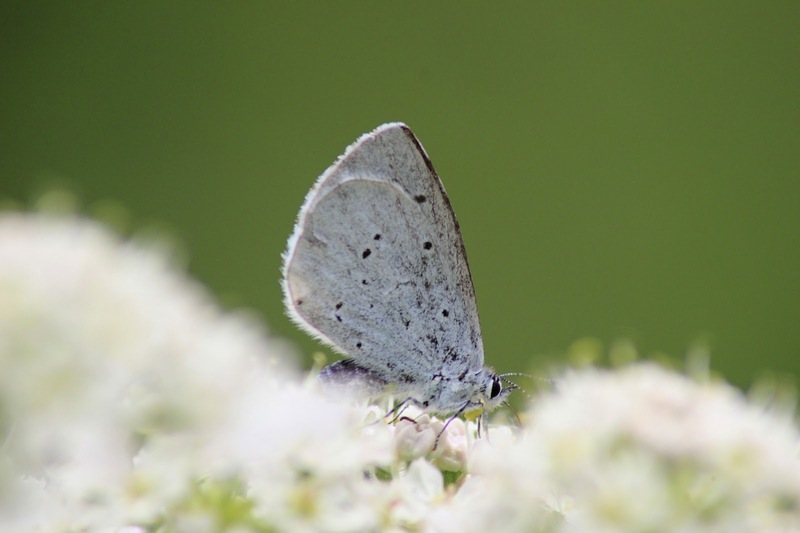 Slightly tatty Holly Blue, Irthlingborough Lakes and Meadows, Northants. 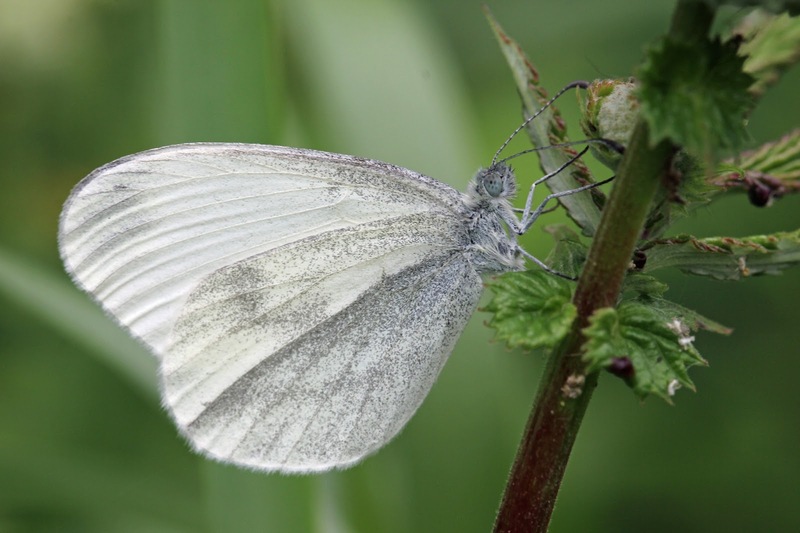 By now the sun was starting to shine and the Holly Blue had whetted my appetite to see some more butterflies so I headed over to Salcey Forest in search of the Wood White. I had been here a week or so ago and only searched the south side without success so this time I tried the north and headed from the car park to the Piddington side of the forest. The crossroads here seems to be an absolute haven for butterflies in the forest, plenty of flowers in the summer coupled with the 4 pathways leading in off (which means whatever way the wind blows the butterflies can find shelter) and it is wide enough to get a substantial amount of sunshine almost all day. 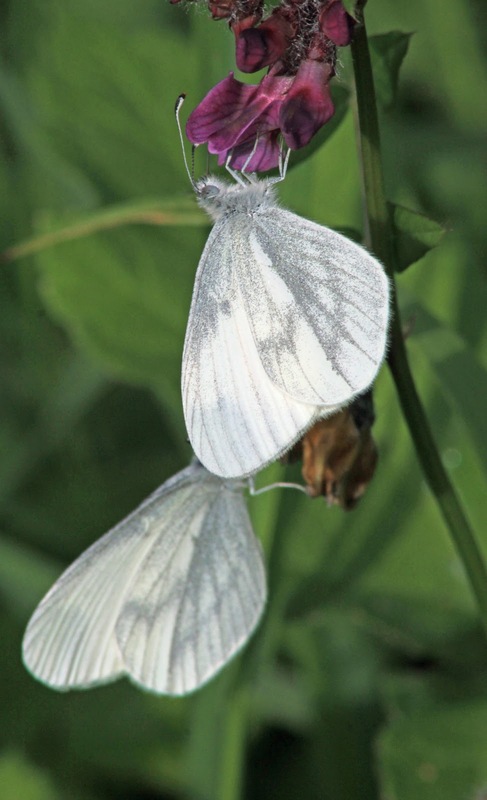 Once again the area didn't disappoint as a couple of Wood Whites fluttered passed on the gentle breeze as I approached from the south and when I reached the crossroads several Whites could be seen. They look so delicate that one wonders how they cope flying against any breeze at all but in fact they are quite strong flyers and a few times one would leave it's flower to whiz up to meet another before performing an amazing spiral "dance" in the air. The sun had got quite strong now and as it had been cloudy all day this had certainly woken them up. Unfortunately it had woken them a little too much and trying to get one settling so I could photograph it was becoming very difficult but I persisted and eventually succeeded. 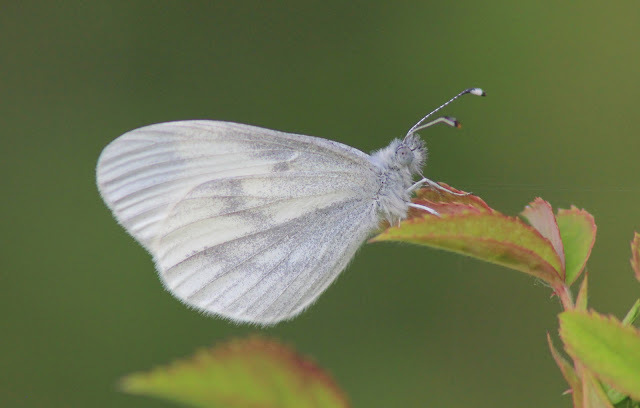 Wood White, Salcey Forest, Northants. From here I called it a day and took a slow stroll back to the car. The sun was coming down and it was getting late. I find it amazing how all the birds come out and start singing almost instantly after the crowds of people go home. All in all it had been quite a nice day! Since the last post spring has been a little dire to say the least. Locally the birds have been few and far between, and those we have been lucky enough to have land at a local reserve have only stayed for a short while before carrying on their migration. My run of luck has certainly run out as due to work I have missed all the waders (what there has been of them anyway) and the only dribble of Black Terns arrived on an evening I was particularly late at work so couldn't get to those either. 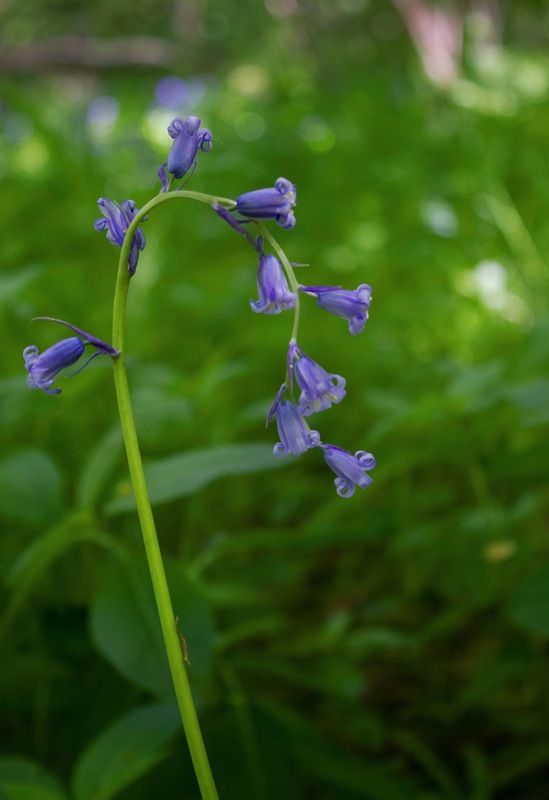 To try and offset a temporary "rubbish spring depression" I have been venturing out over the county boundaries to see some of the other delights neighbouring counties have had to offer. At the beginning of May my mate John Friendship Taylor and me popped along to the Ouse Washes to hopefully catch up with a Red Footed Falcon that has been showing on and off during the previous week. It was a beautiful spring day and we had a very enjoyable stroll along the bottom of the bank of the RSPB section along to the railway line bridge. The Ouse Washes really aren't that far away and are so good it does make me wonder my I don't go there more often but I guess my passion for local birding is the answer to that. 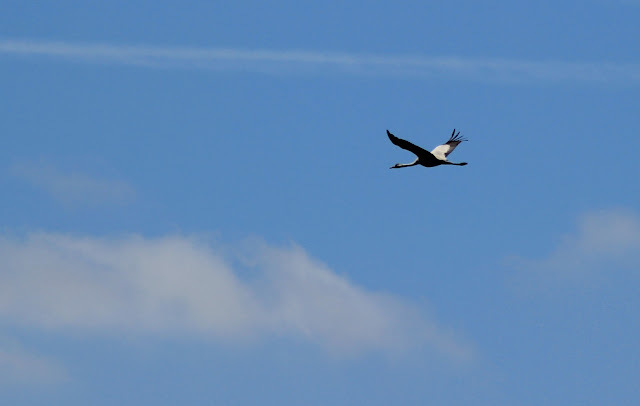 Unfortunately we didn't see the Red Foot but a highlight came in the unexpected form of a Common Crane flying over the top of the bank right over the top of our heads! In fact it even looked at us before turning round and gaining height. I took a pic as it drifted away. On the way out of the reserve I noticed a Corn Bunting singing right next to the road and I managed to sneak up in the car a film it from the car window. The following week another couple of friend joined me and John Friendship Taylor (JFT for short) in the shape of Jon Philpot and his partner Kirsty. We had a very enjoyable day wandering around RSPB Minsmere with great views of the local specialities including Stone Curlew, Little Tern, Marsh Harrier and Spoonbill. The Dartford Warblers up on Dunwich were keeping their head down unfortunately and only fleeting views could be achieved and a very vocal Savi's Warbler very frustratingly would not show itself despite me and JFT putting in what seemed like hours of time trying to see it. We left at nightfall after a great day ambling about. 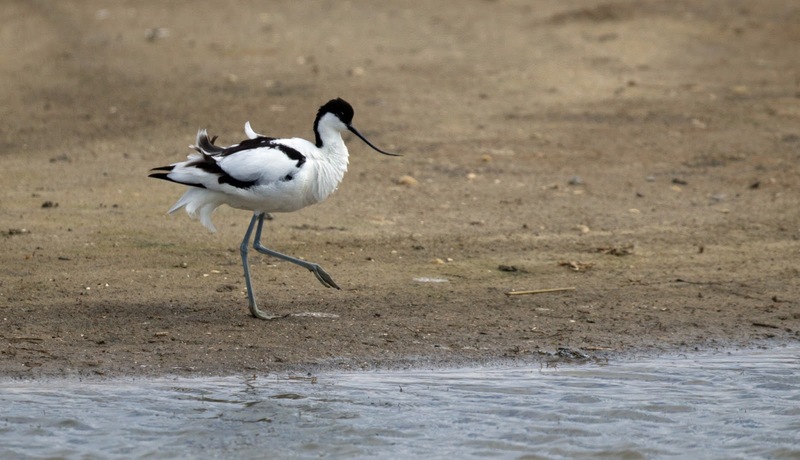 Jon (who's a bird photographer) even let me put my memory card into his set up so I could take a pic of one of the Avocets on the scrape. 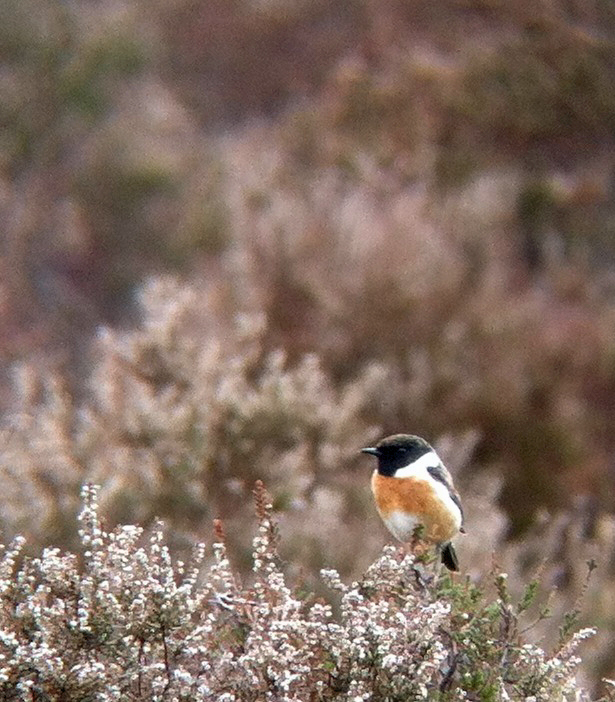 Also at least a Stonechat posed for a photo on the heath even if the Dartfords had other ideas. We spent the final part of the day listening to Bitterns booming and watching the Hobby's hunting from the Bittern Hide. A pint in a traditional Suffolk village pub capped the day off a treat. A couple of weeks passed by after this with little to show for local birding. A Marsh Warbler was reported north of the county which I couldn't help but investigate. 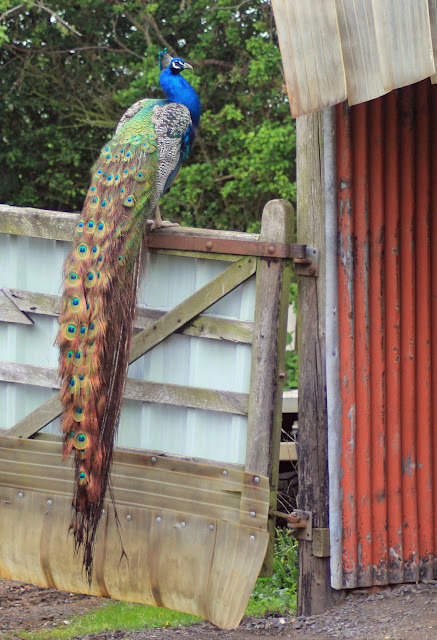 Unfortunately the bird couldn't be found and the best picture I took was of the Peacock guarding the local farm. Not a Marsh Warbler but a nice bird to see despite it being rather unexpected as I walked around the corner in the farmyard. And then for one of the best days birding I have had for what seems like a very long time. 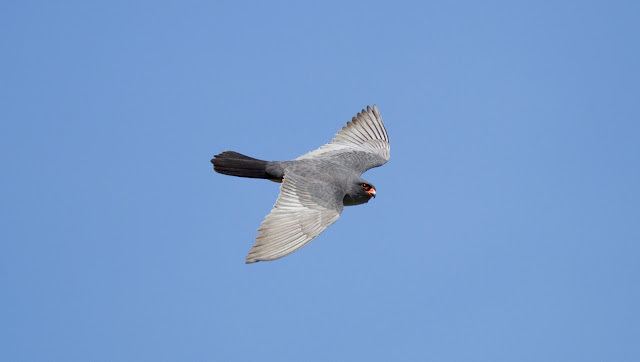 As me and JFT had dipped the Red Footed Falcon earlier in the month we decided to head over the RSPB reserve at Lackenheath Fen as one had been seen there and the photo's being taken looked like it was showing well. Jon and Kirsty joined us once again and early in the morning we found ourselves standing by the central reedbed as the temperature started to warm up. The action started straight away with a Bittern flying in and giving a prolonged view as it drifted over the trees and into the centre of the reeds. As we waited we chatted to the local birders with one whetting our appetite with stories of the Red Foot flying over peoples heads near the pool on the east side and along the path nest to the viewpoint but we still had no sign. It had been seen in the morning perched in the trees one the other side of the reedbed so we decided to make our way over enjoying a view of another Bittern flying in from the opposite direction this time and also a distant view of two Common Cranes flying over the horizon. We stopped near the line of trees and scanned along at it wasn't long before I managed to pick up a falcon shape sitting on the edge. 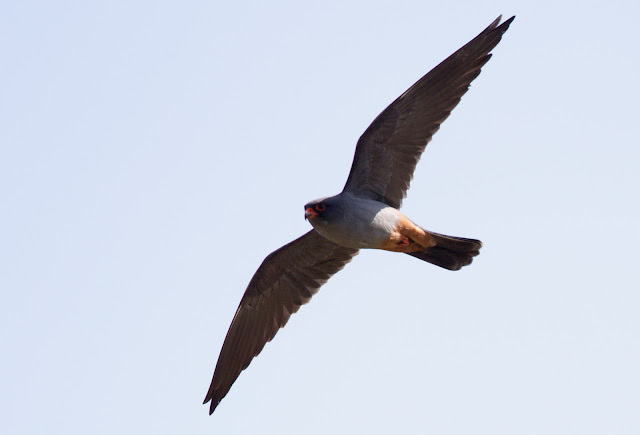 There were a few Hobby's sitting on the branches but this one looked different, zooming in with the scope showed it to be the Red Footed Falcon. It eventually flew out and started to hunt over the reeds and gave great views from where we were standing but as always we wanted a closer look and as it appeared to be whirling over the heads of the photographers on the other side we made our way round. 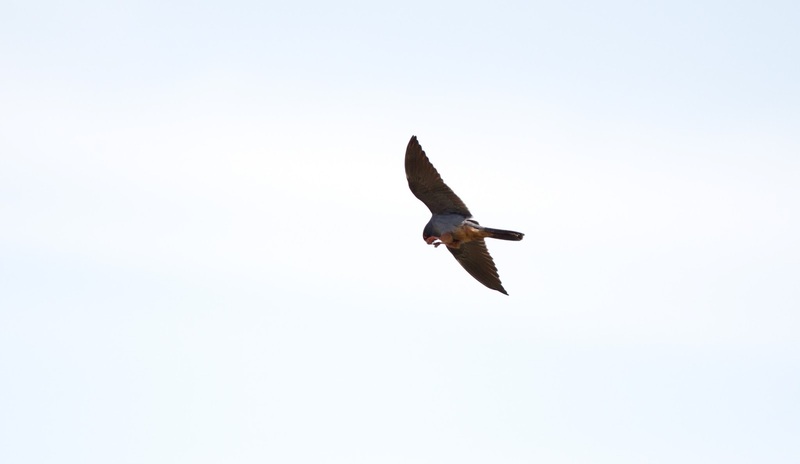 We glimpsed a Barn Owl on the way taking prey back to it's nest site and it wasn't long before we joined the photographers with incredible views of the male Red Footed Falcon sat patiently in the trees infront of us. Every now and then it left on a quick sortie over the reeds before it went back to it's perch. As the day warmed up even more the bird became more and more active and gradually it came closer and closer. The next few hours were simply unbelievable with just insanely good views of this gorgeous little bird hunting so close. At one point it did one of it's quick inflight zig zags before hurtling over to catch an insect no more than 15 feet away from me. As it became more active it did as the local birder had promised and flew from the west side to the east (where the pool is) and it put on a real show - sometimes flying right along the line of birders/photographers. Jon once again offered me his camera to put in my memory card and I spent a while trying to get a shot. Jon has some of the best gear available to a wildlife photographer but despite this it was still a challenge to nail a pic as this thing moved like lightning - in fact the changes in direction this agile bird could perform was putting the local Hobbies (which had now taken to hunting the Swifts putting on their own very spectacular show) to shame. Eventually I started to get better and managed to get some decent shots as it flew over and hunted. And then I got the one I was most happy with as it almost looked straight at me.......what a stunning bird!! The fact that Jon allowed me to use his camera while the bird was showing so well is something that shows what a nice guy he is, and I owe him a lot of gratitude for being able to achieve to above pics. Luckily the day for us got even better as we had been told of a good site for Montague's Harriers further north in Norfolk (I'm sworn to secrecy I'm afraid). We arrived on site to meet good friends of mine Kieran and Leila and we waited patiently for a sign of one of the birds. 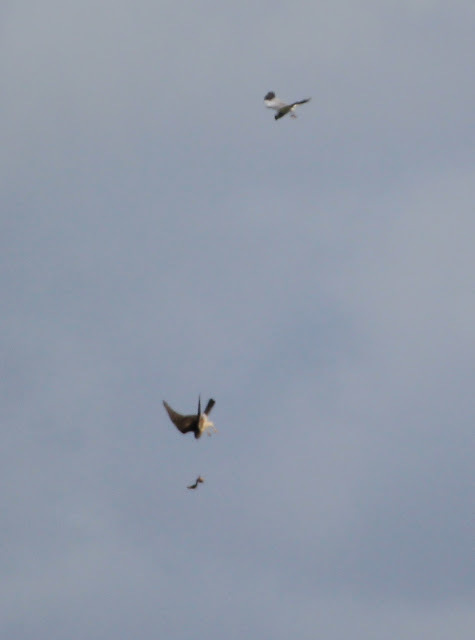 Eventually JFT picked up the male flying in from the right. We had already been told by previous birders that the female was in the field but as they were nesting she was keeping her head down so couldn't be seen. As the male flew closer a view in the scope showed he had what looked like a rabbit in his talons. A trickle of excitement ran through us as we realised we may be lucky enough to witness a Montague's food pass. Jon had lent me one of his spare lenses (infinately better than mine) and as the female rose up I took a series of shots. I watched the food pass through the camera and it wasn't until I got home and downloaded the pics onto the pc that I realised I had somehow managed to capture a few ropey pics. Here is the set. 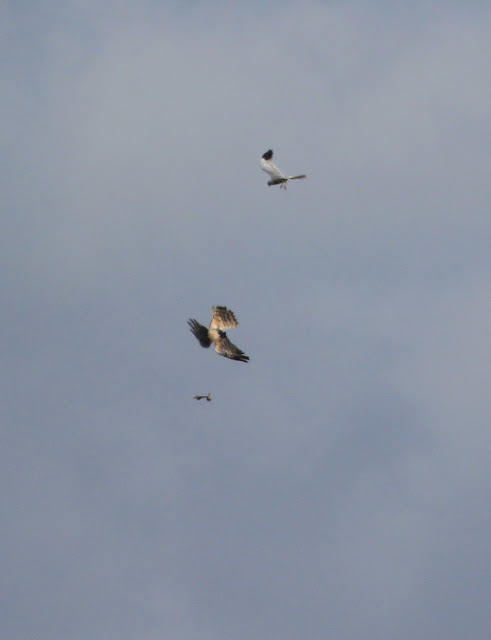 Male bird flies in with prey and female comes to meet him. 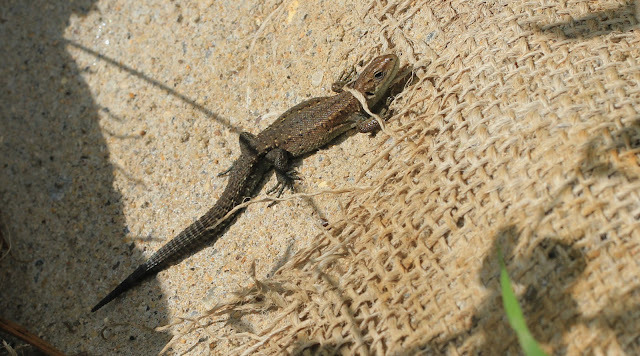 Female starts to position herself below him. 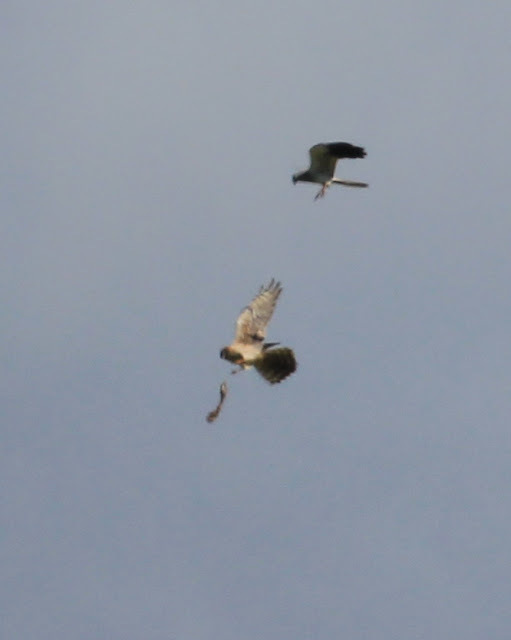 Male Harrier prepares to drop the prey for the female to catch. 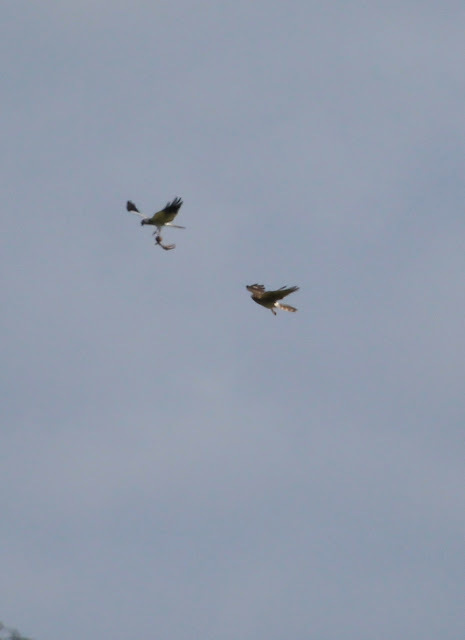 Male drops the rabbit and the female lunges to catch it. Female turns to chase plummeting food item. ......before she catches it a millisecond after this pic was taken. Foodpass and courtship for now complete! After this we parted company as Jon and Kirsty had a room booked to spend the rest of the weekend at Minsmere so me and JFT headed off to Titchwell. Not much to report here unfortunately but the Grey Plovers looked simply stunning in their full breeding plumage. and the Swifts were putting on a real show from the walk down to the new hide. We left here and spent the evening with Robert Smith (a Norfolk birder and all round top bloke) at Dersingham Bog but alas our luck had ended and despite staying until nearly 11pm no Nightjars were heard. 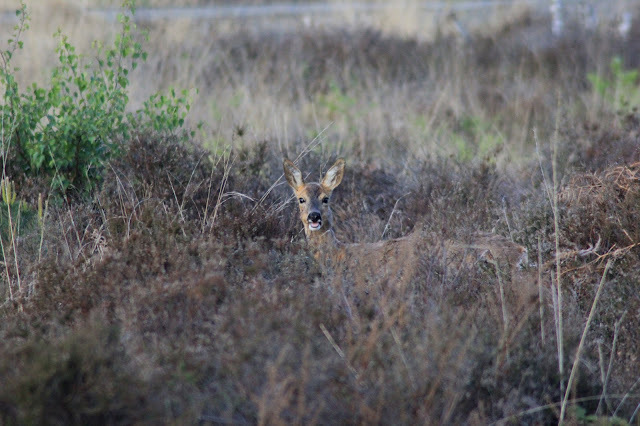 A solitary Gropper reeling away and a curious Roe Deer were our only consolation. The following week I went back to the Washes in Cambridgeshire. This time with another mate of mine, Sam Candy. Nothing too exciting to report but again it was just nice to be out enjoying somewhere different. We had good views of a pair of Common Crane on the Nene Washes and then we moved onto the Ouse Washes where we had 5 Garganey (4 drakes) and bizarrely a Corncrake sub singing from the Common Wash Hide. 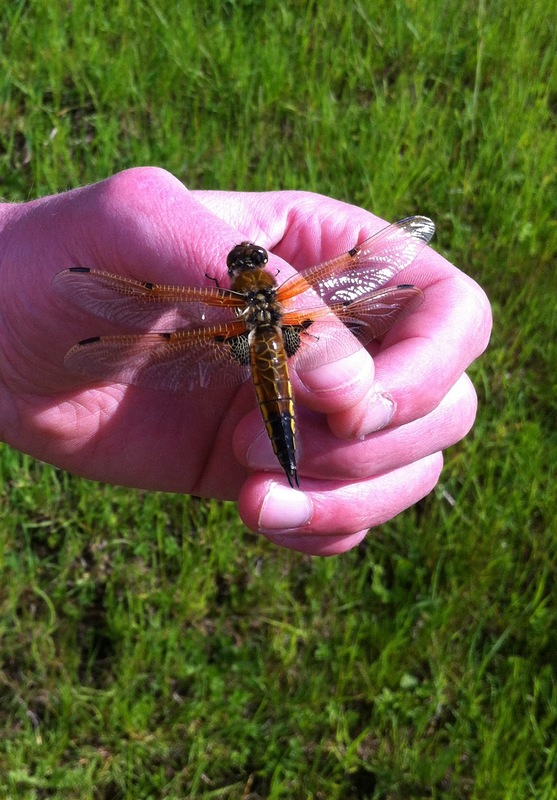 We did have a nice surprise though on our walk along the bank as dragonflies could be seen emerging and this unusually confiding 4 Spotted Chaser even posed nicely on my hand. By now it was the beginning of June and it looked like spring had passed me by locally. Despite missing most of the birds I have spent a few evenings out and about taking pics of wildlife as and when I come across it and as the insects are now starting to liven up there is always something to admire. Here's a selection of the latest photo's. 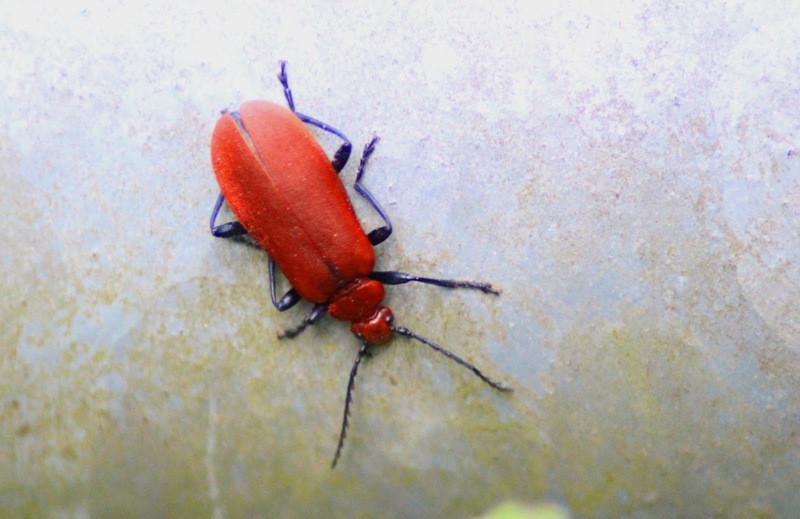 Cardinal Beetle, Glapthorn Cow Pastures, Northants. 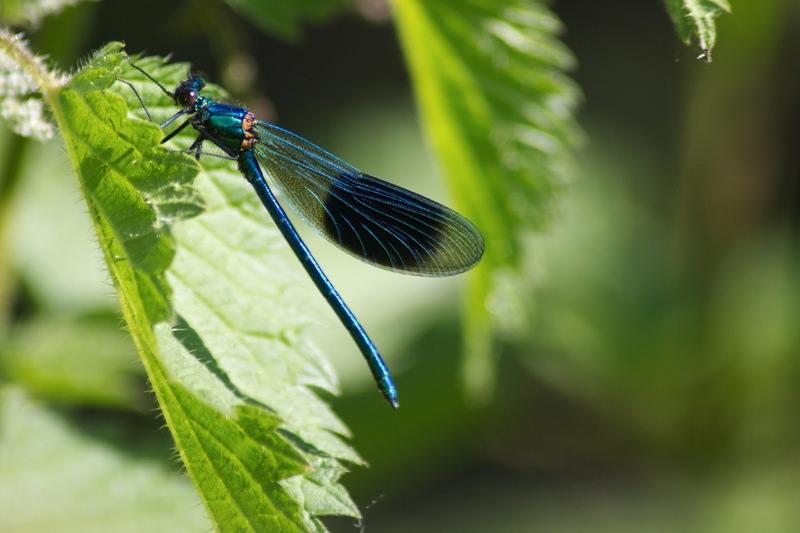 Banded Demoiselle, Stanwick Lakes, Northants. 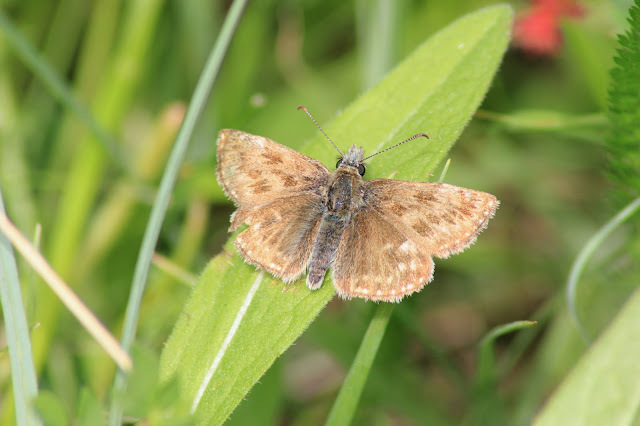 Dingy Skipper, Twywell Hills and Dales, Northants. Grizzled Skipper, Twywell Hills and Dales, Northants. 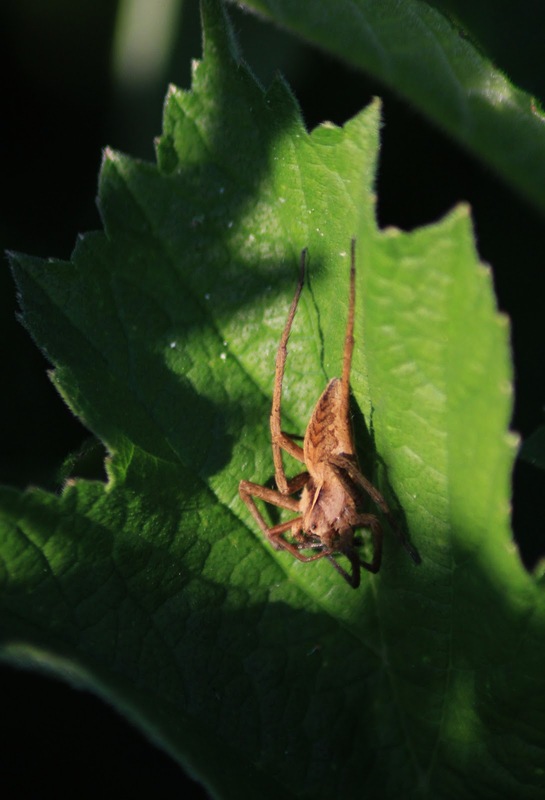 Nursery Web Spider, Whiston Lock, Northants. Sedge Warbler, Titchmarsh Reserve, Northants. 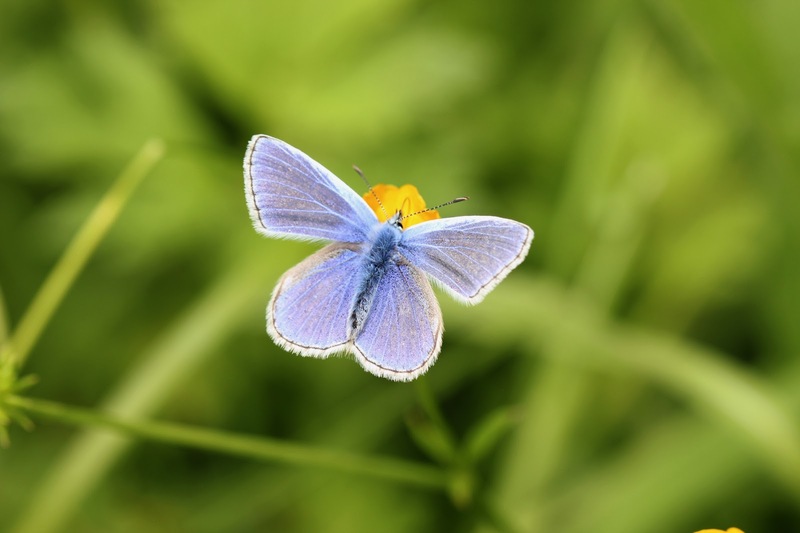 Hopefully the weather will be good to us this year as now the butterflies are starting to emerge. I did neglect the local butterfly sites last year but I feel the urge this time to get out and see them all again. In the next few weeks Purple Emperor, White Admiral and Black Hairstreak should all appear so lets pray for some sunshine and hopefully some good birds added into the mix too! It has been a great few weeks though, perhaps not locally, but by traveling further afield we have had some amazing birding experiences shared with very good company too!